Ranthambore is a village which is popularly known for the Ranthambore National Park. This small village is a part of Rajasthan’s township Sawai Madhopur. Ranthambore gets its name from two hills –‘Ran’ and ‘Thambor’. Tourists love to visit this place from all round the world. Former hunting ground of Maharaja of Jaipur, Ranthambore is an absolute area for all nature freaks. 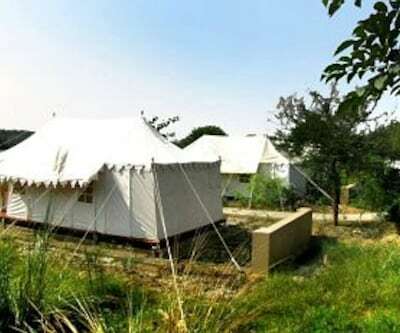 Travellers can find numerous of premium hotels in Ranthambore. the tigress Ranthambore is one of the best 5 star hotels in Ranthambore. The property is situated at village Khilchipur, near Helipad in Ranthambore. The 5 star hotel is nestled amidst charming surroundings and has a magnanimous architecture. Jaipur International Airport is 148 km and Sawai Madhopur Railway Station is 9 km from the hotel. The picturesque view of magnificent hills, pretty lakes, rocky smudges, ponds and beautiful ravines offers an array of comfort to peaceful stay to guests. The rooms are lavishly designed and are groomed with the touch of royalty. These spacious and well-maintained rooms are fitted with all modish amenities. In-room services include personal sit out area, mini bar, Wi-Fi, fitness center, kids’ room and playground, library, a spacious conference hall along with meeting room, an aesthetically designed banquet hall, Spa, Travel Desk and many more. The lavishly designed in-house restaurant serves mouth-watering dishes from around the world. The pleasing lavish ambience enhances the dining experience of patrons. Tourist attractions such as Rajiv Gandhi Museum of Natural History, Ranthambore Tiger Reserve and many other sightseeing places are within the radius of 11 km from the hotel. 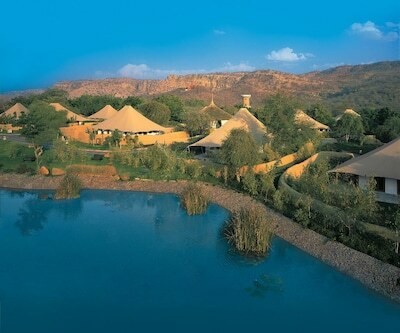 The visitors to Ranthambore who wish to spend their vacation in extravagance environs can make their stay at the oberoi vanyavilas which is 5 star Ranthambore hotels. The property is situated at Ranthambore Road. This property is considered as the finest luxurious jungle resort in India. Nearest airport is 3 to 4 hour drive from the hotel. The property offers a unique, lavish and extravagance accommodation that are filled with modern conveniences like AC, LCD TV, high speed Wi-Fi, a DVD players, iPod dock, electronic safe deposit, direct dial telephone and personal bar. The bathrooms are attached with rooms are well-groomed with designer lights and a bathtub, Patrons can enjoy the Indian and International delicacies at in-house extravagant restaurant along with live music in the al fresco courtyard. The Oberoi Vanyavilas having its close proximity with Ganesh Temple, Ranthambore National Park,Village Women Craft, Rajiv Gandhi Museum of Natural History and with many other. There are some other 5 star hotels in Ranthambore such as Treehouse Anuraga Resort, ranthambore kothi and Juna Mahal that are the perfect blend of style, luxury and modernity. What's the quality of food at Jungle Vilas ranthambhore.? Food is very testy, if you fond of Mutton its so testy. Any Similier category hotel of The Oberoi Vanya Vilas rathambhore.? We can suggest Sherbagh ,The Tigress, Nahagarh Ranthambhore. Which is the best hotel in Ranthambhore? Aman E Khas is the best hotel in Ranthambhore.